Invoicing customers can be a complicated and time-consuming part of running a business, but it doesn’t have to be. With our free invoice templates, you can create professional invoices in MS Word, so there is no need for expensive software. This guide offers information on the benefits of using Word, and how to use the program to create an invoice from scratch. We have also provided a range of blank invoice templates for you to download and customize to suit your business needs. It’s important to note that this guide does not cover invoicing legal requirements, such as your sales tax obligations, and only covers Word’s role in the design and creation of invoices. No fees – Some invoice software packages incur a hefty purchase price or require ongoing subscription fees. MS Word is a software application usually included with computer purchases, so it is a cost-effective way to create invoices. Many invoicing solution providers base their fees on businesses raising a minimum number of invoices each month. This is not the case with MS Word as you can create 1 or 100 invoices without having to pay a premium for the privilege. Ease of use – What attracts business owners to using MS Word is its simplicity. It is one of the more recognizable and user-friendly word processing applications, and there are countless online tutorials available if needed. The intuitive formatting means that you don’t have to be a computer whiz to create a document that is both functional and professional looking. Flexibility – The beauty of MS Word is the ability to integrate with other programs and incorporate items from other applications and sources. You can cut and paste Excel spreadsheets, insert downloaded images, and email an invoice, all via MS Word. Another advantage is being able to save invoices in a variety of formats such as PDF and as a web page. Despite the definite benefits, MS Word does have its limitations. As examples, MS Word can’t be used for complex equations, and it can’t automate calculations. If you need this level of functionality, it may be better to use MS Excel instead. We have a great range of free MS Excel invoice templates ready for you to download and use. A mix of thin black dividers, blue tabs, and blue grid lines make this invoice sample resemble a notebook. The standard layout with left-aligned billing details and terms are consistent with formal documents, though the light design twist on this template gives it more appeal. The heading should include your business name or logo and the word “Invoice” in a large font to make it clear that the document is separate from price quotes and estimates. You can use the Header option in Word as a way to insert the heading items only once and have them repeat on subsequent pages. If you have a company logo, you can place it in the header by inserting a picture file, then resizing and positioning it as desired. For consistency across your business documentation, ensure that all written items, including the heading, are displayed in the same font. According to a study by the Software Usability and Research Laboratory, the most legible fonts are Arial, Courier, and Verdana, with Times New Roman the least preferred. The issuing date of the invoice and the payment due date should be displayed near the top of the document, usually directly below the header. Using MS Word, you can select the Automatic Date feature that automatically inserts the date for you. This feature is useful if you mail out hard copies of your invoices; however, if you send invoices electronically, the current date always displays when viewed. If this is the case, you may prefer to insert the invoice and payment due dates manually. Sequential numbering – This method enables you to store all invoices in one folder and is useful if you do not want to arrange your invoices by client. In MS Word, you can use an AutoNew macro that will automatically create a sequential number for each new invoice, avoiding the potential for duplicated or skipped invoice numbers. Whichever method you choose, the invoice number should appear near the top of the invoice and should correspond with relevant documentation previously sent to the customer e.g. a quote or job estimate number. To add your business and client information, first insert a text box, and split it into two columns labeled “BILL FROM” and “BILL TO.” Then click and drag to resize and position the text box as desired, and type in the information to the respective column. If you are sending the invoice electronically, you have the option of including form fields, a function that enables the recipient to provide the required information in a fillable text box. In any invoice, you will need to include billing information that clearly outlines what the invoice is for and what the customer owes for each product or service. ID – This is a sequential number, usually starting with “01,” for quick reference if needed. DESCRIPTION – This may include details on items such as services, materials, labor, and customer discounts. Instead of a full text description, you may wish to include a billing code e.g. “MAT” for materials, or “DISC” for customer discounts. QTY – This column is to display the quantities of each line item..
PRICE – This is a per unit cost, and it should display the relevant currency e.g. $70.00. TOTAL – This is a manual calculation of the unit quantity x unit price. If you’re charging sales tax, this should be displayed below a subtotal of the itemized charges, and before the overall total, which can be bolded so as to stand out from other figures. Since MS Word does not have a sophisticated automatic calculation function, you will need to manually calculate the subtotal and total and insert these figures into the appropriate table cells. If you accept other payment methods such as PayPal, insert the relevant logo, resize and position it, and if you are sending the invoice electronically, add a hyperlink to direct the customer straight to the web payment portal. You may also wish to include a simple “Thank you for your business” in its own text box or within the document footer as a friendly sign-off to your customers. You’ve created your invoice, and now you need to send it to your customer for payment. Using MS Word, you can save the invoice as a PDF file then attach it to an email prior to sending. One benefit of the PDF format is that the customer will able to open and view it easily in any browser. Secondly, PDF documents are secure and are “read-only,” meaning that they cannot be altered once sent. If you’ve decided that invoice template for Word is exactly what your business needs, but don’t have the patience to install an invoice generator, or the time to start one from scratch, take a look at our examples. All you need to do is download the invoice design you like, amend the information to suit your business, and you’re ready to send a professional invoice to your customers. Need help with different invoice formats? See other examples we have: freelance invoice templates tailored for freelancers and contractors, commercial invoice for commercial transactions, service invoice template for both professional and non-professional services, and photographer invoice template with various invoicing methods. You can also download a proforma invoice to confirm the commitment to sell goods for a certain price and at certain terms. A thin horizontal header presents your logo above a blue page divider before digging into the financial details. Shaded boxes contain the billing information and also fill the transaction breakdown, which contrasts with the bold header background of the invoice itself. The condensed layout leaves plenty of space for terms and a thank-you note. Professional fonts pair with traditional blue color theme create a business invoice template that suits companies of all sizes and types. Logos for your brand, preferred payment options, and the beneficiary give the template a modern look to match the clean layout. This free blank invoice design features chunky serif fonts and thick dividers. Light blue tabs denote categorical banners and payment terms for optimized organization and readability. The information hierarchy is consistent with traditional invoices, but the personality embodied is completely unique. Fresh green color accents highlight categories and titles in both the invoice breakdown and header, which allows the reader to locate relevant sections with ease. The “total” box features full shading that matches the thin dividers used throughout. Classic fonts and a professional layout make this a polished yet modern template. Smooth, solid grid lines in slate gray pair with the stark black “total” tab for a modern look with minimal design elements. The horizontal header contains distinct sections for invoice information, as well as room for your logo. Clear fonts and spacious alignment improve readability. Timeless fonts and a traditional organization scheme make this classic invoice template suitable for all transaction types. Visible grid lines and bolded totals keep the information easy to read. Space for your company logo in the top right corner, along with customizable “bill to” text allows you to tailor this document to your brand. A distinct left margin filled with billing details replaces the standard horizontal header for an updated look with two shades of gray to keep information organized. The invoice body features the same combination of shading, as well as grid lines to accommodate several items. Left-aligned payment terms complete the document in the bottom left corner, which contrasts with the placement of your company’s logo. This professional invoice template uses traditional formatting and standard left alignment to present nothing but the facts. The horizontal header with space for a logo features minimal design accents so you can customize the look to your brand. Ample space for payment terms and banking information follows the price breakdown. 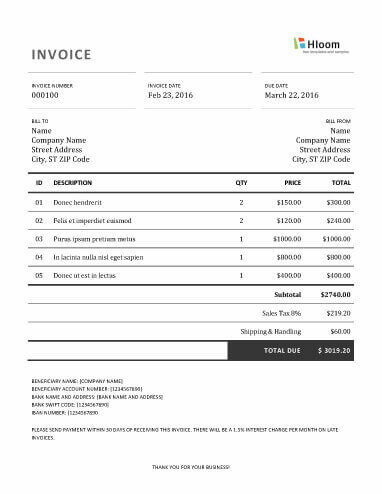 Large sans serif fonts and even spacing without grid lines make this invoice template resemble a corporate document. The page layout stretches from the top margin to the bottom by including payment terms and transactional details with plenty of whitespace in between. A large page title can be customized to your brand. Padded rows and columns filled with pastel shades of blue give this invoice design a layered effect with perfect spacing and clean lines. The modern right alignment used to capture the invoice details, along with sans serif fonts, make this template visually pleasing and easy to read. Thin, solid dividers create a distinct header and invoice section for a straightforward price breakdown with all the relevant details presented clearly. Your company logo lines the left margin and pairs with the teal total box to add subtle visual elements to the page. An uncomplicated organization scheme with all black titles make this simple invoice template a valuable go-to for corporations or small businesses. Space for a logo on the top of the page allows you to personalize the template, while small contact details line the bottom. An open grid and shades of navy and pale yellow give this eye-catching invoice a classic look with subtle details. Different sized fonts in a yellow accent color pair with the miniature logo to add layers of design to this template without cluttering the page. Delicate fonts pair with thin, lime green dividers to add a pop of detail to this classic invoice template. The minimalist header and small font give the look a modern twist with customizable colors and space for a logo in the top right corner. Horizontal dividers in a bold shade of orange keep this invoice organized with titles and transaction details that are easy to read. Ample white space mixes with the formal text to create a professional invoice with space for a thank-you note. 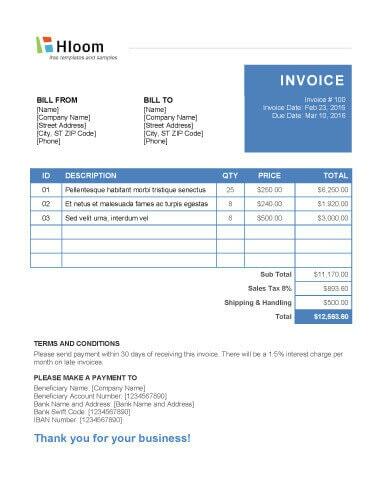 A centered page title and business logo anchor this eye-catching invoice by contrasting with the colored rows that make up the invoice body. The page’s colors change from cool to warm tones, which helps divide up the white space and draw attention to the numbers. An elegant shaded background divides this sample invoice into two main sections, giving it an air of sophistication that still maintains a clean presentation. Transactional details precede the modern price summary, while your logo and a contrasting “invoice” tab add even more custom details. Three rectangular boxes accompany the invoice title to present the core details in a straightforward fashion. Traditional fonts fill the easy-to-read grid section, which features subtle blue shading. 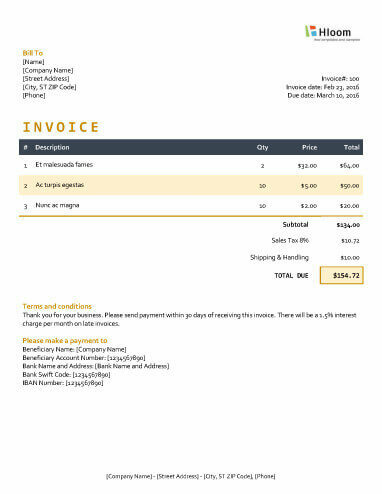 Payment details and terms complete the document with a modern layout below the invoice total.